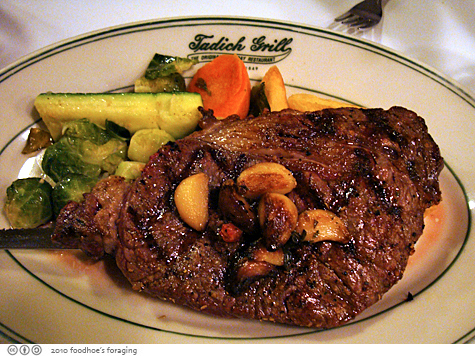 The Tadich Grill is a local treasure that captures the history, ambiance, and flavors of old San Francisco. 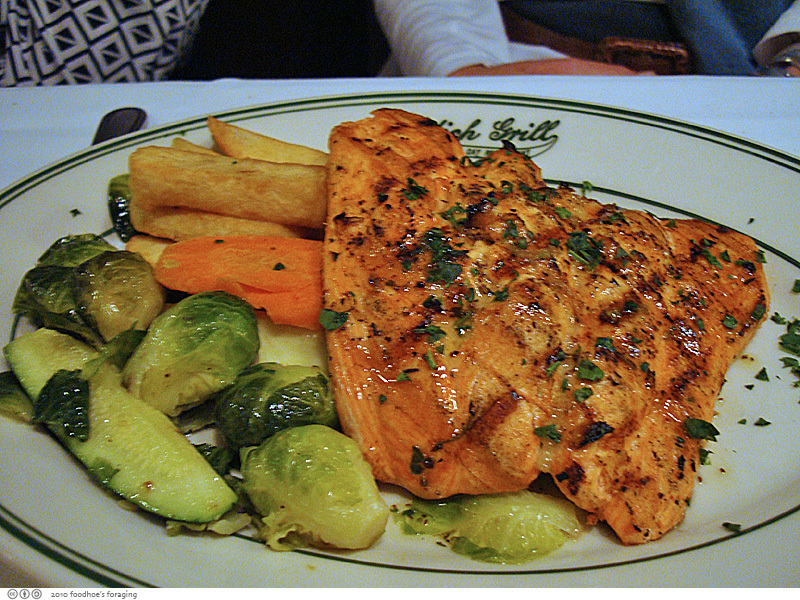 It’s California’s oldest restaurant, operating in the financial district since 1849 and there’s nothing trendy about the place, which is known for its straightforward seafood dishes and Barbary Coast atmosphere. 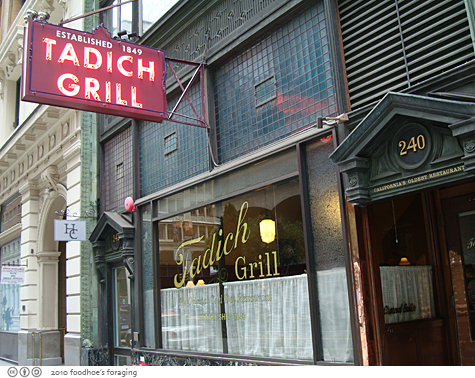 As far as landmarks go, the Tadich Grill is older than Coit Tower or even the Golden Gate Bridge! 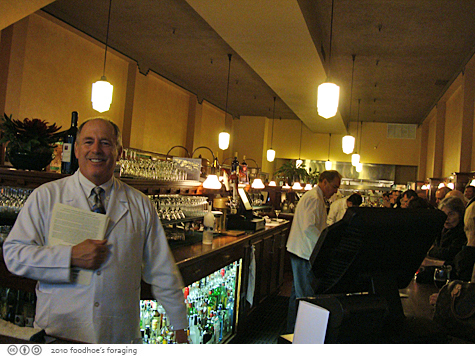 The waiters all have on white linen jackets that look a bit like lab coats, but they go with the wainscotting, and wood-paneled booths, representing an old-school San Francisco dining experience. Crossing the threshold feels like you’ve been transported to another era, what I imagine a men’s club would be like with dark polished wood, shining brass fixtures and private booths. There’s room to breath with dining areas separated by partitions, hooks and places to hang your coat and purse, the conveniences of a distant past. 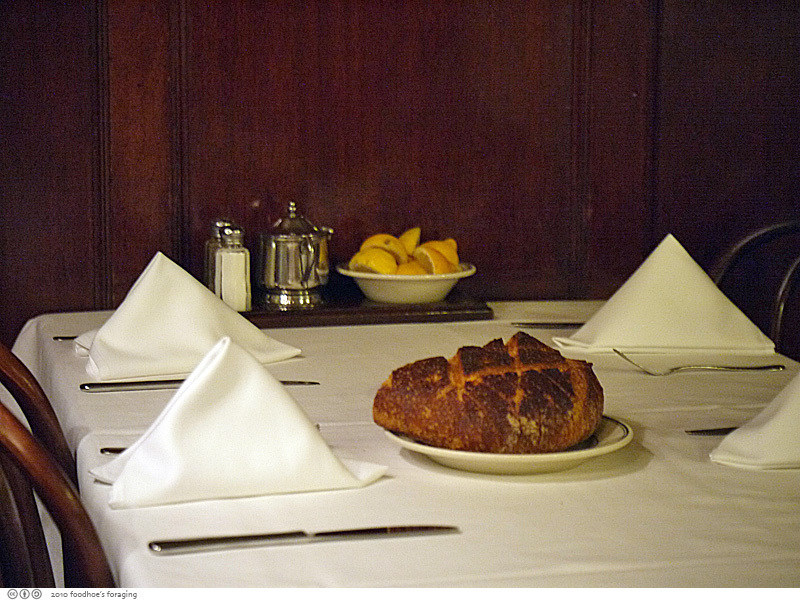 The dark booths are accented by the crisp white tablecloths and linen napkins and each table is equipped with a bowl full of lemon wedges and a plate full of crusty Boudin sourdough bread slices with tinfoil wrapped butter. It has a delightful crust, with a soft tender interior full of airy pockets that are perfect to fill with butter. The menu features hearty seafood and other local specialties, and the Tadich claims to be the first establishment to grill seafood over mesquite charcoal in the 1920s. 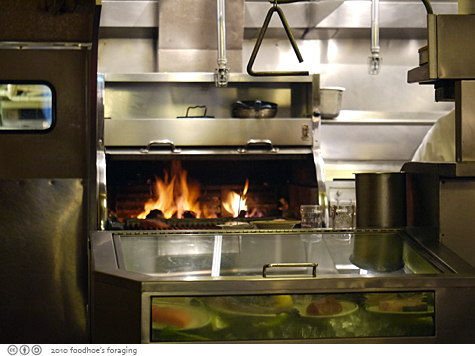 In 1998, it was awarded the James Beard Foundation American Classic restaurant award, which honors legendary family-owned restaurants across the country. I recently came here twice with some friends, and had to order the Seafood Cioppino ($26.25) which is a house specialty. Cioppino is a classic San Francisco dish that is believed to have been invented by the fishermen in North Beach in the late 1800s, a fish stew that’s the equivalent of the French bouillabaisse or the Italian Cacciucco. It’s a luxurious stew made with generous chunks of crabmeat and fish, prawns, meaty scallops, clams and mussels in a tomato based broth that is the definition of comfort. The clams are steamed separately and the fish sauteed with butter and olive oil for each serving before being combined with the hot soup and the prawns and crab are shelled to make the dining experience less messy. The cioppino is served with delectable slices of toasted sourdough bread that has been brushed with olive oil and garlic and lightly grilled. 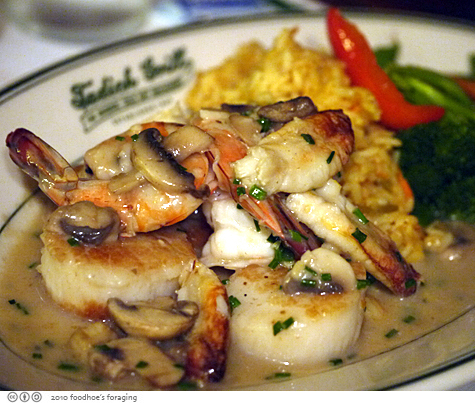 Debbie N had this gorgeous looking Seafood Saute ($26) a generous pile of scallops, prawns and dungeness crabmeat sauteed with white wine and mushrooms served with rice and vegetable of the day (I just love that old style verbage)! The Panfried Calamari Steak ($20.75) was breaded and fried and served with long branch potatoes, vegetable of the day and a rich, zesty tartar sauce full of chopped pickles. 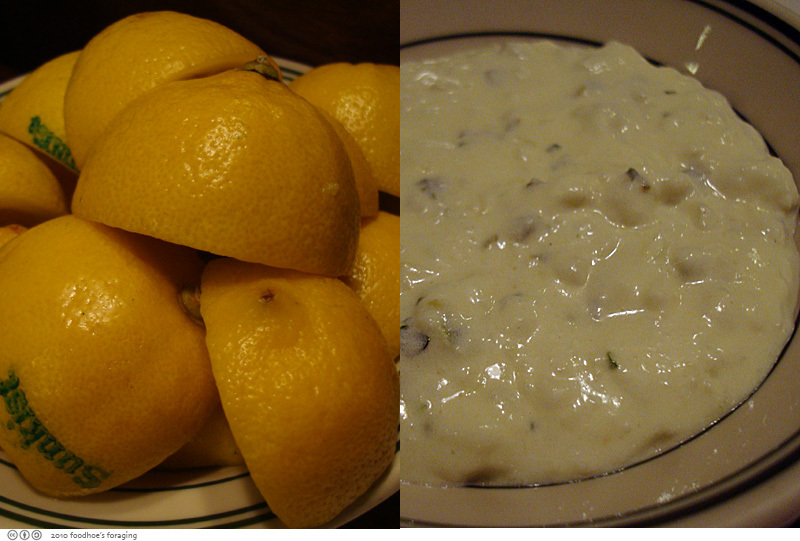 The calamari was perfect slathered with tartar with a squeeze of lemon to brighten things up. Debbie N couldn’t resist the mesquite broiled Ribeye Steak ($23), served with roasted garlic garnish, potato and vegetable of the day. And I had to have the Chocolate Mousse ($8.25), after hearing my friends Cody and Brennan rave about it for so many years. It was rich and decadent, the perfect thing to split among friends. 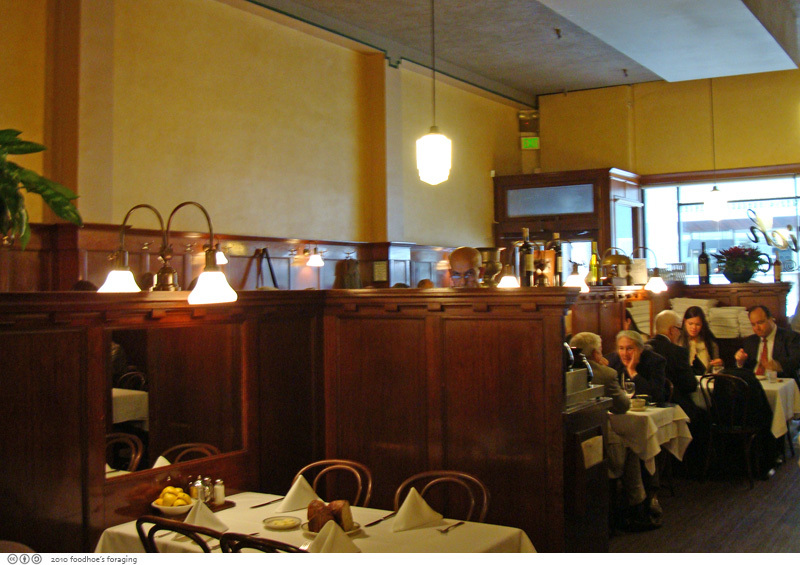 The Tadich is known for a stiff drink, great atmosphere, and if you have a hankering for an old fashioned San Francisco dining experience, there’s nowhere better. What a great place! The food looks mouthwatering. Try the Sand Dabs the next time. 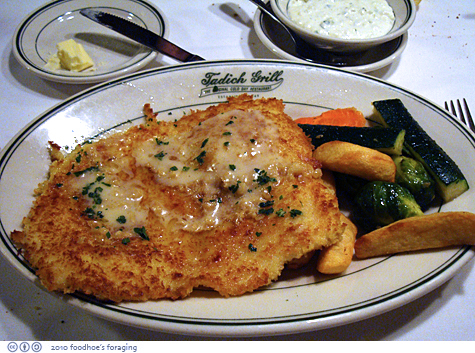 Tadich’s is the only place I have had them where the crust and sauce don’t turn to a gluey mess some time during the meal. The best! I’ve never been here too, but always wanted to try the cioppino there. Now I have to go for that AND the chocolate mousse! 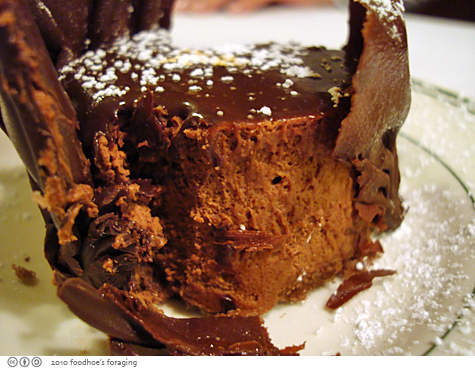 speaking of treats, that mousse is enough to fill my weekly quota of decadence–wowza! I feel like an idiot that I have never been here, after living in the Bay Area most of my life and SF for 14 years! 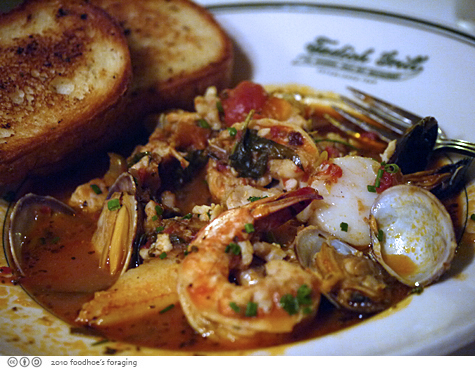 I love cioppino…my dad used to make it, and I’ve made it once or twice, but I would love to get it at the Tadich Grill. Talk about a San Francisco institution. What a coincidence! I was literally walking by Tadich Grill this morning thinking that I should check it out soon! Now I KNOW I have to and get that yummy Seafood Saute! Wow! 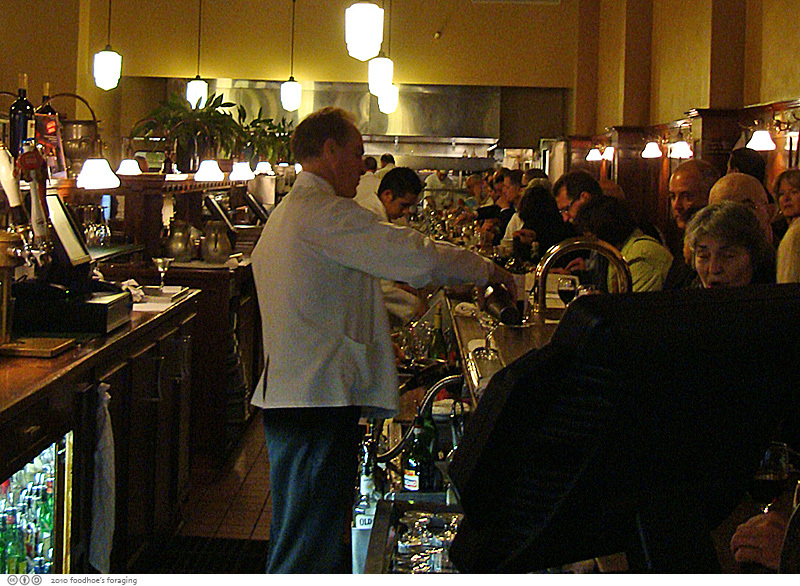 It’s good to know that the oldest resto in CA is still cranking out tasty eats! The “lab coats” offer a dapper touch, wouldn’t you say? gastronomer, I love those lab coats! I just wanted to take a minute to tell you that you have a great site! Keep up the good work. i like this type of post…………. Okay, so I am confused. Is the Cioppino that you guys are talking about the “Seven Seas soup” that is on the menu or is this something totally different? Hmmm, I don’t recall seeing that soup on the menu, and since cioppino is such a san francisco tradition,I’m inclined to say no. The Seven Seas soup is not the Cioppino that is regularly on the menu. We have had the seven seas and it is to die for. We returned this past Christmas and asked for it again and were told that it is not a regular menu item and that it nly on there as a specialty item every now and again. Well specialty item it is as it is truly to die for. I wish it would be come a regular menu item as that was one of the reasons we can back to SF for the holidays and the reason we came to eat that night. It is a must have when you see it offered! Adrienne, thanks for visiting! I will look for that on the menu, I love the name, it sounds so intriguing. Is it a chowder? It’s amazing post contains very useful information. Thanks for sharing.